Listed by Steve Gillespie at Sutton Grp-West Coast Realty. Water as far as the eye can see! This a stunning 2 or 3 bedroom view home only steps to the beach, pier & shops of fabulous White Rock. This home has been lovingly updated over the past few years & is magazine worthy. The kitchen boasts new cabinets, quartz counters, marble backsplash & stainless appliances. The master ensuite is straight from Dwell magazine with its soaker tub, frameless glass shower with rainshower head & floating vanity. To top it all off is one of the best rooftop decks one will find north of the 49th. 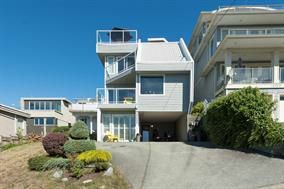 535 SF of unmatched views spanning from Blaine to Point Roberts with the pier smack in the middle. Invite your friends for dinner on the deck followed by laughs in the hot tub into the night. This one must be seen.